Figure 1. GAK protein engineering and site suppressor rescue mutations. (A) A diagram showing both FL GAK with its major domains and GAK1–400 with various mutation sites. The KD mutation is shown in blue, the gatekeeper Thr site with a star, and the AS mutations in red. (B) A cartoon illustrating the chemical genetics strategy of using a gatekeeper mutation to enlarge the ATP-binding pocket of a kinase to allow detection via a non-radioactive method. (C) An initial kinase screen of HA-tagged GAK gatekeeper mutants T123A and T123G with bulky ATP analogs (BN, Benzyl; FF, Furfuryl; PH, Phenyl) shows that although T123A can use FF (red box), kinase activity is greatly reduced. Thiophosphate ester antibody (THP) is used as a readout of kinase activity. 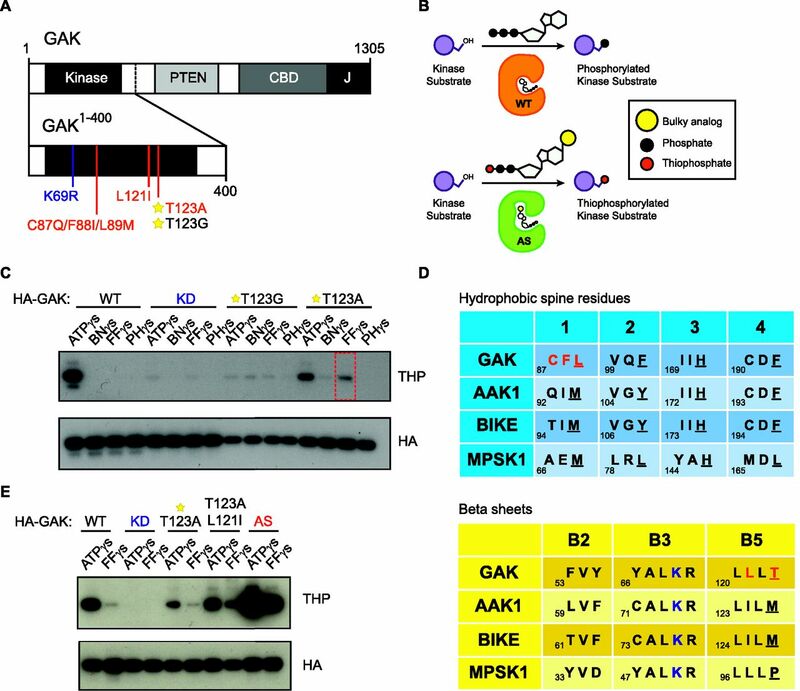 (D) Kinase alignment of NAK family hydrophobic spine residues and β sheets as a strategy to identify potential secondary site suppressor mutations. Red indicates the aas mutated in the final AS kinase. Blue indicates the active lysine site. In the hydrophobic spine table, hydrophobic spine residues are underlined. In the β-sheet alignment table, the gatekeeper residue is underlined. (E) Site suppressor mutations can rescue the loss of GAK activity caused by gatekeeper mutation. The final AS mutation containing T123A/L121I/C87Q/F88I/L89M successfully restores GAK activity. Figure S1. V99 and C190 mutations do not rescue kinase activity. (A) A kinase screen of the HA-tagged GAK gatekeeper mutant T123A with additional rescue mutations at V99G, V99A, C190G, C190A, and C190T using either wildtype ATPγS or FurfurylγS (FFγS) show that none of these mutations are capable of rescuing kinase activity loss. Thiophosphate ester antibody (THP) is used as a readout of kinase activity. Figure S2. 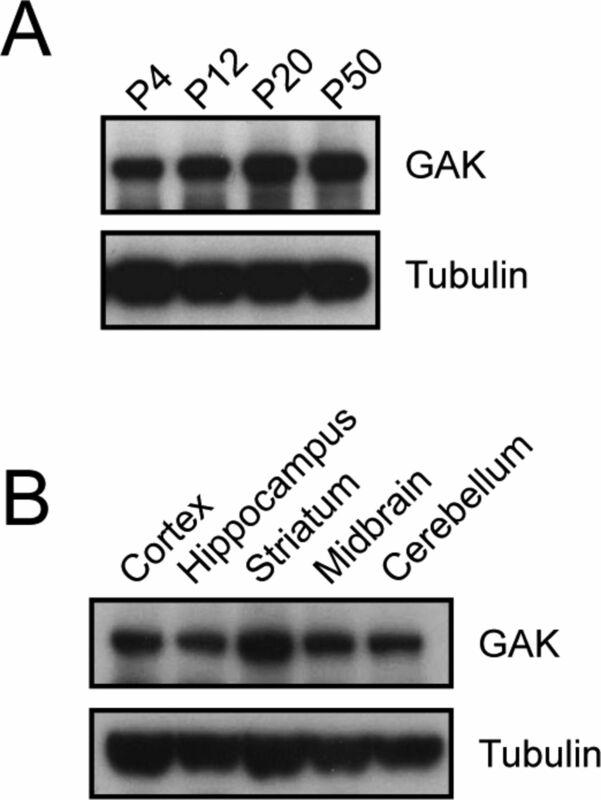 GAK is expressed in neurons. (A) GAK is expressed throughout mouse development at P4, P12, P20, and P50. (B) At P15, GAK is expressed within different regions of the mouse brain, including cortex, hippocampus, striatum, midbrain, and cerebellum. Figure 2. Chemical genetic identification of GAK substrates. (A) A cartoon showing the covalent capture method for identification of kinase substrates from P11 mouse brain lysates. Grey represents proteins phosphorylated by endogenous kinases. Red shows thiophosphorylated proteins and blue indicates cysteine-containing proteins. (B) GAK substrates Atp1a3 and Sipa1L1 are identified during a chemical genetics screen. Several other potential candidates are shown to illustrate the presence of a small TG motif. * Indicates the phosphorylated threonine residue identified. Bold indicates the small TG motif consistent with identified substrates. 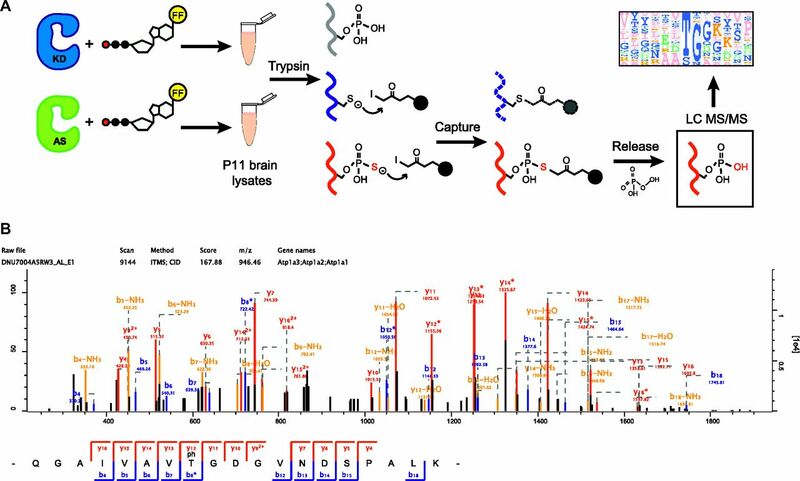 (C) Mass spectroscopy identification of Atp1a3 phosphorylation by spectra analysis of Atp1a3-derived peptides containing phosphorylated T705. Figure S3. Sipa1L1 is a GAK substrate. (A) Cartoon showing the different domains of Sipa1L1. (B) Sipa1L1 is immunoprecipitated by GAK from HEK 293T cells co-transfected with myc-tagged FL GAK WT and HA-tagged Sipa1L1 FL and Act1 domain. HA-tagged and myc-tagged pRK5 vectors have been used as IP controls. (C) Sipa pT249 is detected only in HEK 293T samples co-transfected with HA-tagged Sipa1L1 Act1 WT and FL GAK WT. The Sipa1L1 Act1 T249A mutant does not show pT249, nor do co-transfections with GAK FL KD. (D) pT249 is present in E18 rat embryonic brain lysates but decreased in adult rat brain lysate (P = 0.002), while Sipa1L1 is low in E18 and elevated in adult (P = 0.0009). GAK amounts are relatively similar (P = 0.19). Graph data represent means ± SEM, *P < 0.05, **P < 0.01, ***P < 0.001, t test. Numbers 1–3 represent independent samples from different brains. Figure 3. 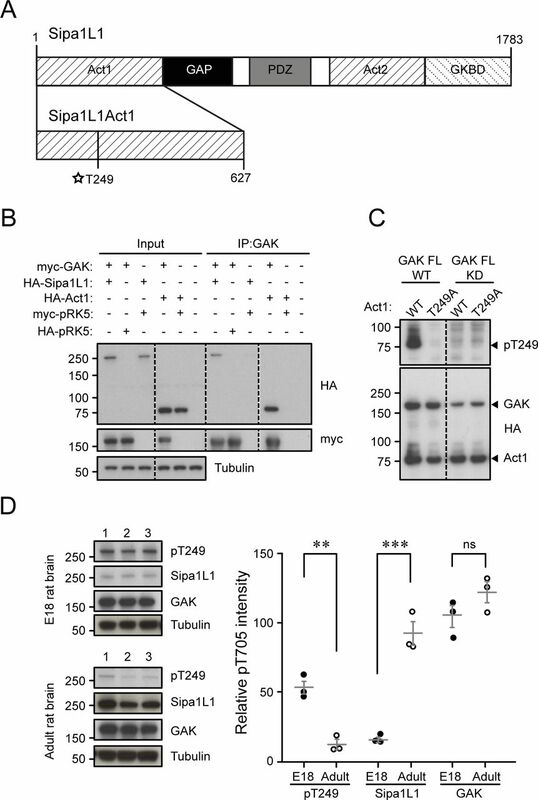 GAK phosphorylates Atp1a3 at novel site T705 in HEK 293Ts. (A) Atp1a3 is immunoprecipitated by GAK from HEK 293T cells co-transfected with myc-tagged FL GAK WT and HA-tagged Atp1a3 WT (left panel). Atp1a3 is also able to be immunoprecipitated by myc when cells are co-transfected with myc-tagged GAK1–400 and HA-tagged Atp1a3 WT (right panel). HA-tagged and myc-tagged pRK5 vectors have been used as IP controls. (B) Atp1a3 pT705 is present in HEK 293T samples co-transfected with Atp1a3 WT and either FL GAK WT or GAK1–400 (left). Atp1a3 T705A mutants show reduced pT705, as do GAK KD mutants (centre). GAK1–400 pT705 levels are similar compared to FL GAK (right). Graph data represent means ± SEM, n = 3 independent experiments, GAK FL (WT/TA P = 0.02, KD/WT P = 0.001, KD/TA P = 0.005), GAK1–400 (WT/TA P = 0.04, KD/WT P = 0.05, KD/TA P = 0.009), *P < 0.05, **P < 0.01, ***P < 0.001, t test. (C) HEK 293T cells co-transfected with HA-tagged FL GAK WT and HA-Atp1a3 WT and pretreated in serum-free media were incubated with either DMSO or 5 μM of GAK inhibitor 12g, 12i, or 12g+i for 1 h n = 3 independent in duplo experiments. Graph data represent means ± SEM, 12g P = 0.009, 12i P = 0.009, 12g+i P = 0.03; *P < 0.05, **P < 0.01, t test. (D) Co-transfections of HEK 293T cells with HA-tagged Atp1a3 WT and either HA-tagged GAK or AAK1 demonstrate that GAK is the primary kinase phosphorylating Atp1a3 at T705. n = 5 independent experiments. Figure 4. Endogenous phosphorylation of Atp1a3 is regulated by phosphatases. (A) pT705 is present in E18 rat embryonic brain lysates but decreased in adult rat brain lysate (P = 3.4 × 10−5), while Atp1a3 is low in E18 and elevated in adult brain (P = 9.1× 10−6). GAK levels are relatively similar (P = 0.35). Graph data represent means ± SEM, *P < 0.05, **P < 0.01, ***P < 0.001, t test. Numbers 1–3 represent independent samples from different brains. (B) Cortical rat cultures treated with phosphatase inhibitors OA (0.5 μM) and CSA (10 μM) show an increase in pT705 intensity that is absent after CIP treatment. (C) Rat cultured hippocampal neurons were treated with the following for 30 min: no treatment control (Con), 50 μM glutamate (Glu) P = 0.86, 1 μM tetrododoxin (TTX) P = 0.0002, 50 mM KCl P = 0.74 or 30 μM ouabain (Oua) P = 0.77. n = 3 independent in duplo experiments. *P < 0.05, **P < 0.01, ***P < 0.001, t test. Figure 5. Atp1a3 phosphomutants show alterations in subcellular localization. (A) Co-transfections of either YFP-β1 (black) or YFP-β2 (red) with HA-tagged Atp1a3 WT, TA, and TD in HEK 293T cells show different immunoprecipitated glycosylated forms of the ATPase β-subunit. Solid arrows indicate lower MW intracellular forms, and empty arrows indicate the higher MW plasma membrane forms of the β-subunit. Graph data represent means ± SEM, n = 5 independent experiments, TA/β1 intra P = 0.0009, TD/β1 intra P = 6.2 × 10−9, TA/β2 intra P = 2.5 × 10−6, TA/β2 membrane P = 0.05, TD/β2 intra P = 4.4 × 10−13, TD/β2 membrane P = 0.04; *P < 0.05, **P < 0.01, ***P < 0.001, ****P < 0.0001, t test. (B) COS7 cells transfected with HA-tagged Atp1a3 WT with DMSO treatment as negative control, dual NAK family inhibitor treatment 12i IVAP-1967 (12i) + LP-935509 (LP) and Atp1a3 T705A mutant cellular distribution are shown (red is HA immunostaining showing Atp1a3, blue is DAPI). Scale bar = 25 μm. (C) Atp1a3 staining intensity was normalized to total intensity value for each cell. Y axis shows normalized distance from cell's centre (1) to its periphery (0). The plots show average and standard error of mean (n = 23, 34, 31 cells for Atp1a3 + DMSO, Atp1a3 + 12i + LP, Atp1a3 T705A, respectively). (D) Data points at the peak for the control group at periphery are compared using ANOVA and paired t tests for individual groups. P-values of these comparisons are P = 0.06 Atp1a3 +12i, **P < 0.01 Atp1a3+ 12i &LP, ****P < 0.0001 Atp1a3 T705A + DMSO. Figure S4. Atp1a3 surface biotinylation. (A) YFP-β1 (black) or YFP-β2 (red) were co-transfected with HA-tagged Atp1a3 WT, TA, and TD in HEK 293T cells. Surface proteins were labelled with biotin, washed, and isolated with streptavidin beads. Graph data represent means ± SEM, n = 6 independent experiments with β1, n = 4 independent experiments with β2. β1/TA P = 5.8 × 10−8, β1/TD P = 2.8 × 10−14, β2/TA P = 4 × 10−6, β2/TD P = 2.8 × 10−5; ****P < 0.0001, t test. Figure 6. Atp1a3 phosphomutants show altered trafficking in neurons. (A) GFP-tagged Atp1a3 WT and phosphomutant TA co-transfection with DsRed in DIV15 rat hippocampal neurons demonstrate different localization patterns. Scale bars: 5 μm (dendrites), 1 μm (spines). (B) Neurons transfected with GFP (magenta) as cell fill and HA-ATP1a3 (HA immunostaining shown in green). Cultures are immunostained for endogenous EEA1 (red). Merge between HA-Atp1a3 and EEA1 is shown in the right panel. A zoomed-in image of a section of dendrite outlined with dashed lines is shown in insets. WT Atp1a3 is found dendritic spines (blue arrowheads), whereas Atp1a3 T705A is not found in spines (blue arrowheads). Atp1a3 T705A accumulates in intracellular compartments more frequently than WT Atp1a3, a subset of intracellular Atp1a3 puncta co-localizes with EEA1 (white arrows) and while others do not co-localize (yellow arrows). Atp1a3-T705D does not display any concentrated accumulations in dendrites and does not localize to spines (blue arrowheads). Scale bars = 5 μm. Figure S5. 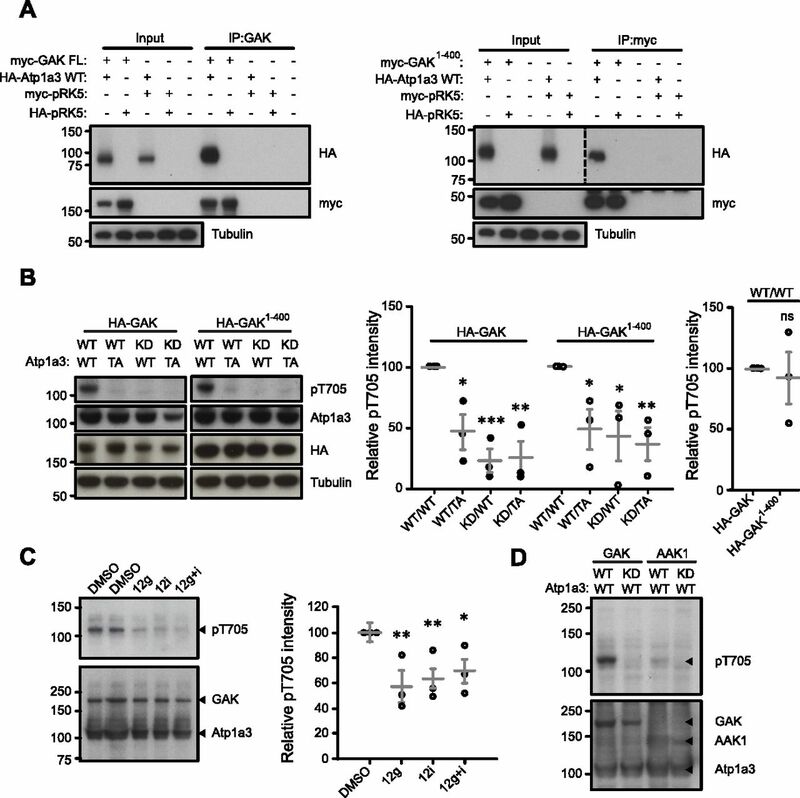 HA-tagged WT and TA mimic GFP-tagged plasmids, while TD demonstrates ER retention. 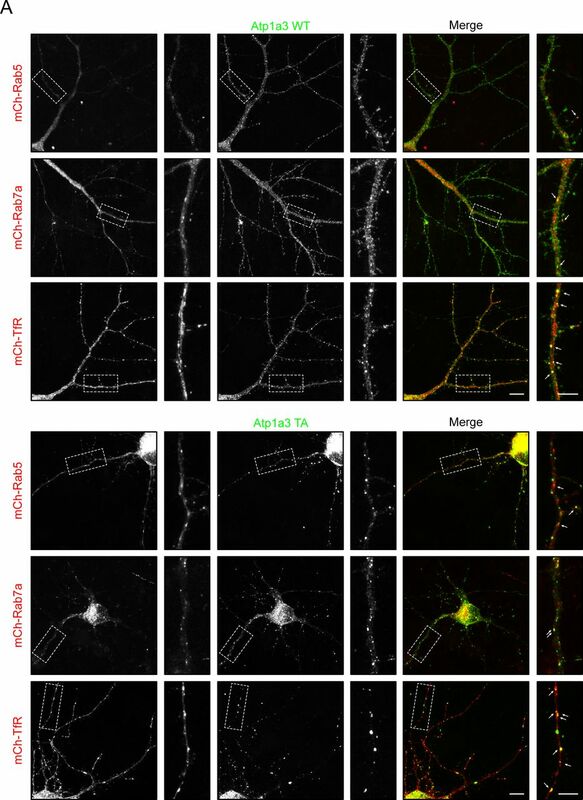 (A) HA-tagged Atp1a3 WT and phosphomutant TA or TD co-transfections with GFP in DIV14-DIV22 rat hippocampal neurons demonstrate different localization patterns. Scale bars: 5 μm (dendrites), 1 μm (spines). Arrows point to the area shown in high-magnification inset. (B) 3–5 stacked images from a confocal series showing HA-tagged Atp1a3 TD co-localization with mCherry-ER3 but not mCherry-tagged Golgi7 in hippocampal rat neurons. Scale bar: 7.5 μm. (C) A neuron expressing GFP (magenta) and HA-tagged Atp1a3 T705A (green) is shown. Immunostaining for endogenous LAMP1 is shown in red. Merge of HA-Atp1a3 TA and LAMP1 is shown in the right panel. A zoomed-in image of a section of dendrite outlined with dashed lines is shown in inset. LAMP1 co-localization with Atp1a3 T705A is very limited. Scale bar = 5 μm. When quantified, we find no significant difference between co-localization of WT and Atp1a3 T705A with LAMP1: 9.2 ± 3.2% of WT Atp1a3 puncta co-localize with LAMP1 and 7.8 ± 2.9% of Atp1a3 T705A co-localize with LAMP1, n = 3 cells each. Figure S6. 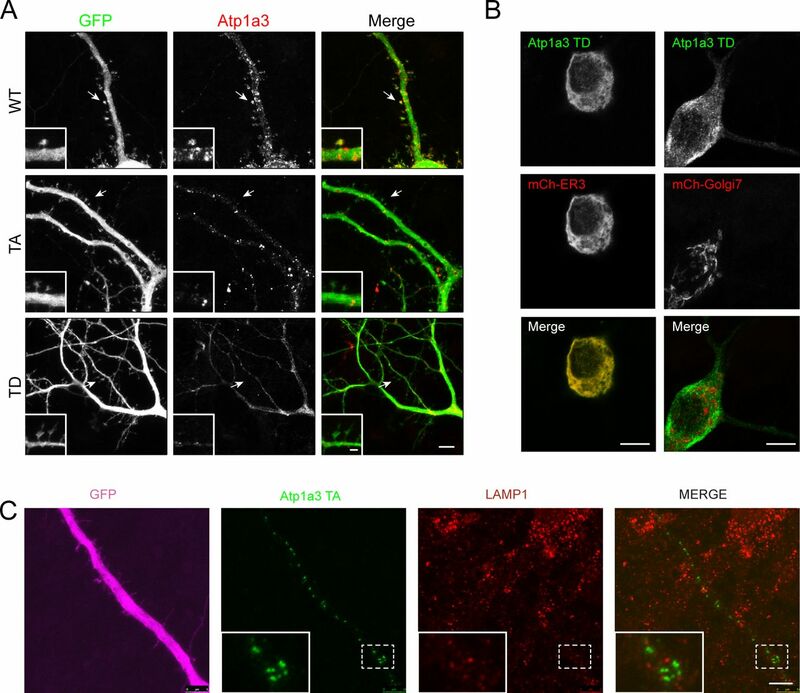 Lower-magnification images of neurons expressing HA-tagged Atp1a3 and GFP. (A, B) Same neurons shown in Fig 6B are shown. Dendritic arbors of neurons are typical for neurons at 14 DIV, axons which may belong to this neuron or others in the culture coverslip can also be seen. 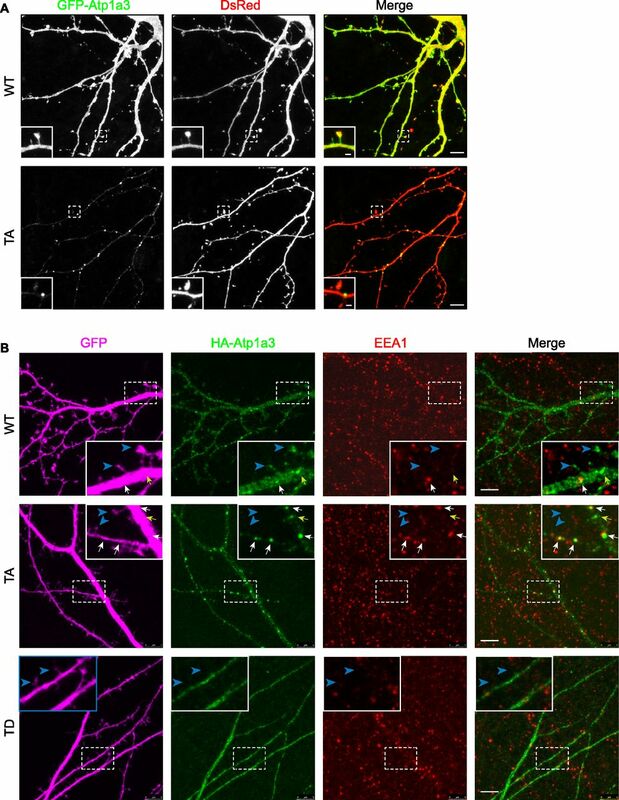 Atp1a3 HA localizes to dendrites and spines, Atp1a3 T705A localizes preferentially to intracellular accumulations, and Atp1a3TD localizes diffusely inside the dendrites and cell body, consistent with ER localization. Scale bars are 50 μm for (A) and 10 μm for (B). Figure S7. Atp1a3 TA phosphomutant shows co-localization with endosomal markers. (A) Atp1a3 WT and Atp1a3 T705A phosphomutant both show co-localization with endosomal trafficking markers for early (mCh-Rab5), late (mCh-Rab7), and recycling (mCh-Tfr) endosomes. Figure 7. Na+/K+-ATPase function is affected in GAK NexCre conditional knockout mice. (A) Cortical lysates of NexCre/GAK conditional knockout mice show a reduction in GAK levels (P = 1.0 × 10−5) and a slight increase in Atp1a3 levels (P = 0.0003) but not in PSD-95. n = 11 F/+ and 8 F/F animals. Graph data represent means ± SEM, *P < 0.05, **P < 0.01, ***P < 0.001, ****P < 0.0001, t test. (B) Whole-cell patch clamp recordings from CA1 pyramidal neurons show a rapid increase in firing rate and RMP upon application of 30 μM ouabain. 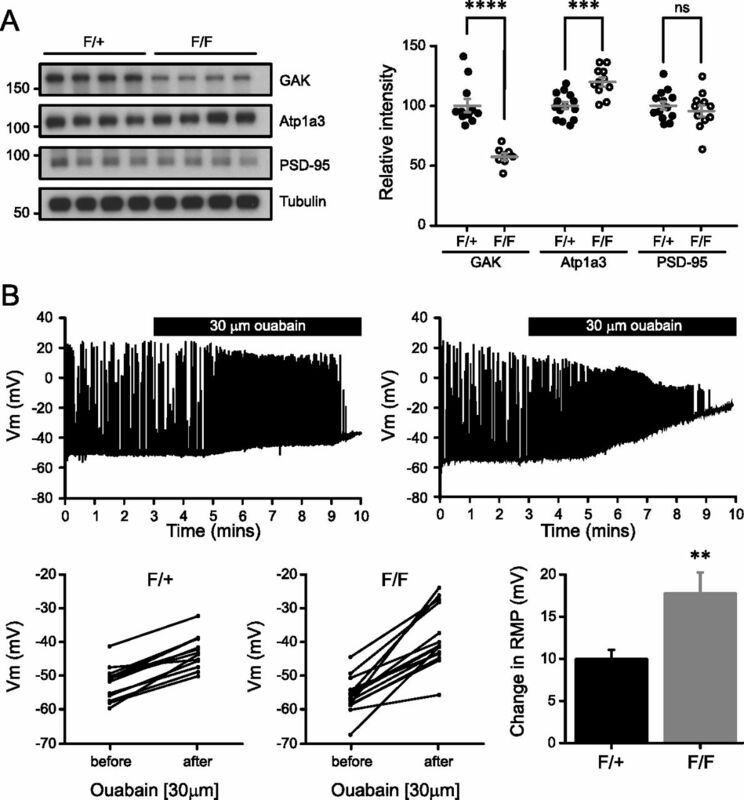 Mutant F/F neurons show a significantly larger change in RMP than F/+ controls. Graph data represent means ± SEM, **P < 0.01, P = 0.003. Figure S8. 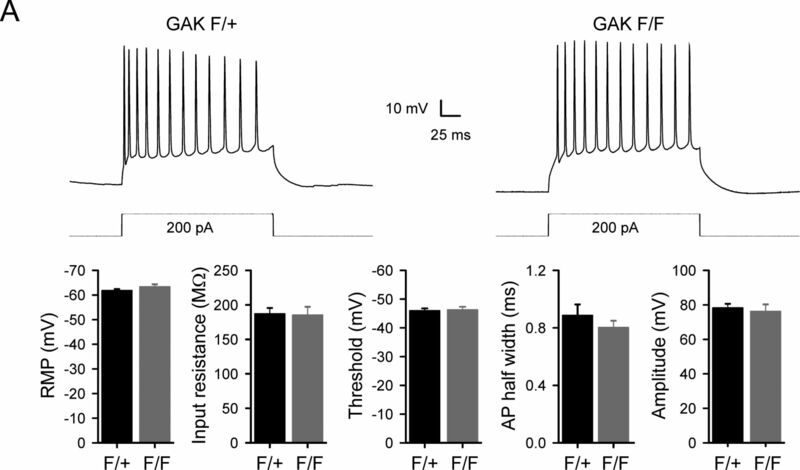 No changes in intrinsic neuronal properties of NexCre/GAK conditional knockout mice. (A) A representative response to a 200 pA depolarizing current injection in control and mutant CA1 pyramidal neurons. The firing characteristics and intrinsic properties did not differ between control and mutant neurons. Figure 8. GAK function in cargo trafficking. (A) A simplified model of GAK function during NKA cargo transport. 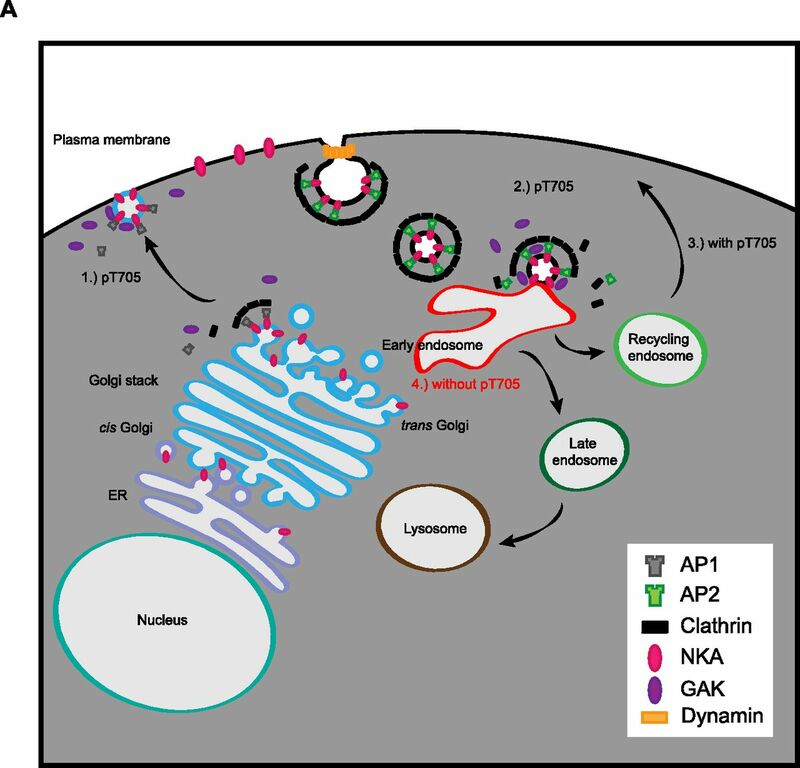 (1) AP-1 and clathrin mediate transport from the Golgi to the plasma membrane during which Atp1a3 T705 may be phosphorylated by GAK. (2) AP-2 and clathrin mediate the endocytosis of NKA. During uncoating, phosphorylation of Atp1a3 T705 may occur. (3) Under basal conditions, GAK phosphorylates NKA at Atp1a3 T705, and NKA is recycled to plasma membrane. (4) Without T705 phosphorylation, NKA is preferentially localized to EEA1 containing early endosomes. Table of potential GAK substrates. Intrinsic property values of neurons prior to ouabain application.